From March 30 to July 27, The Birmingham Museum of Art presents "Vanishing Worlds: Art and Ritual in Amazonia," an exhibition of spectacular and rare works of Amazonian material culture, including full body costumes, masks, feather headdresses, body ornaments, baskets, weapons, pottery, and textiles. The carefully crafted and vibrantly colored objects were made for use in rituals and ceremonies central to the life of Amazonian peoples, and range in age from 30 to 100 years. Many were worn by shamans and other community members during rituals such as name-giving ceremonies for the young, initiation into adulthood, and rituals surrounding death and bereavement, harvest, and healing. "The incredible art and material culture of the Amazon has not been widely shown or published - it is not well known," says Emily Hanna, Curator of the Arts of Africa and the Americas at the Birmingham Museum of Art. "These masterful works are compelling not only for their brilliant forms, but for their profound significance within the culture. We are very pleased to be able to bring these works to Birmingham." The objects in Vanishing Worlds exhibit exquisite artistry and, although utilitarian, are masterpieces of color and design. They are made from materials gathered from the forest, including wood and bark, beetle wings, grasses, shells, seeds, clay, and beeswax. Perhaps the most visually stunning objects are made with brilliantly colored feathers of some 40 species of birds, including parrots, macaws, and herons. These artworks give shape to belief, and embody tightly woven relationships between the human community and natural environment, and between the visible and invisible worlds. The exhibition highlights eight tribal groups, including people of the Ka'apor, Karajá, Tapirapé, Ticuna, Shipibo-Conibo, Shuar, Kayapó, and Xingu River regions. These groups inhabit a vast area that ranges from the Atlantic coast of Brazil to the foothills of the Andes in Peru and Ecuador. Prior to European exploration in 1500, some three to five million people lived in the Amazon River basin. Today fewer than 100,000 Amazonian tribal people survive in an area that covers 2.5 million square miles. While most of the cultures represented by artifacts in this exhibition still exist, the vast majority of the tribes of the Amazon have disappeared. The unique and fragile works in Vanishing Worlds reflect the threatened existence of their creators, as well as the crisis of the rainforest environment in which they were made. This exhibition was organized by the Houston Museum of Natural Science and has been shown at the Cantor Art Center of Stanford University, the Mayborn Museum at Baylor University, and the University of Pennsylvania Museum of Art and Archeology. The Birmingham Museum of Art is the final venue for the exhibition. 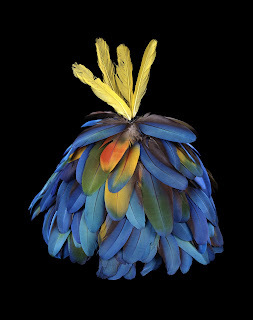 IMAGE: Mekragnoti: Headdress, Kayapo-Mekragnoti people, Brazil, vegetal fibers, feathers from Scarlet Macaw, Blue-and-yellow Macaw, Hyacinth Macaw. The Adam Mekler Collection Courtesy of The Houston Museum of Natural Science (HMNS Kayapo: Mekgragnoti 005).